According to Denis Manturov, it was decided to hold the premiere public debut of the MC-21-300 aircraft with a passenger interior at the Moscow international aviation and space salon MAKS-2019. “This will allow us to visually demonstrate to potential customers and future passengers one of the most important competitive advantages of the Russian airliner — an increased level of comfort,” — mentioned the Minister of Industry and Trade. 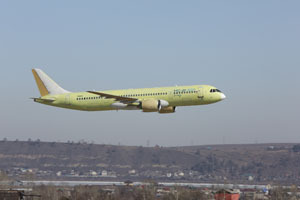 Yuri Slyusar, President of UAC and Irkut Corporation, added that in 2019 the fourth MC-21-300 prototype, built at the Irkutsk Aviation Plant, will join the flight tests. “Airplanes are built on new automated lines that provide high precision and quality of assembly,” — said Yuri Slyusar.